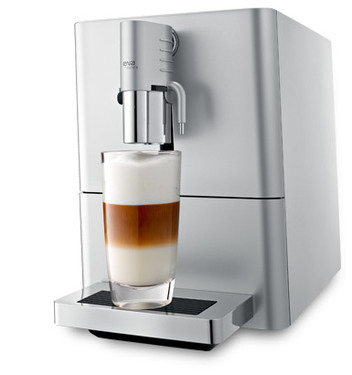 The compact one-cup machine prepares latte macchiato, cappuccino, espresso, café crème and hot water at the touch of a button. The newly developed micro brewing unit ensures excellent espresso quality. Operation is so straightforward that it can be summed up in two words: press – enjoy. The easy-to-understand symbols and ergonomically arranged buttons give you exactly what you want without any fuss. The height-adjustable dual spout features separate coffee and milk pipes to ensure perfect hygiene. Even when space is at a premium, the ENA Micro 9 is still able to provide lovers of speciality coffees with maximum enjoyment. Operation is so straightforward that it can be summed up in two words: Press – enjoy. The easy-to-understand symbols and ergonomically arranged buttons give you exactly what you want without any fuss. The state-of-the-art fine foam technology turns out specialities topped with milk foam that can only be described as a luxurious treat. The dual spout, which is height-adjustable on a continuous scale (55 – 138 mm), features separate coffee and milk pipes to ensure perfect hygiene. Jura is really raising the bar and its ENA Micro 9 offers an impressive range of specialities at the simple touch of a button: latte macchiato, cappuccino, café crème, espresso, hot water serving. The newly developed micro brewing unit ensures espresso quality of the highest standard. Inside the bean container, there is an aroma preservation seal to keep the coffee beans nice and fresh. Energy efficiency class A set by the FEA.